Ballast 1903 watches are inspired by submarines, and the Trafalgar Dress BL-3126-02 GMT is no exception. 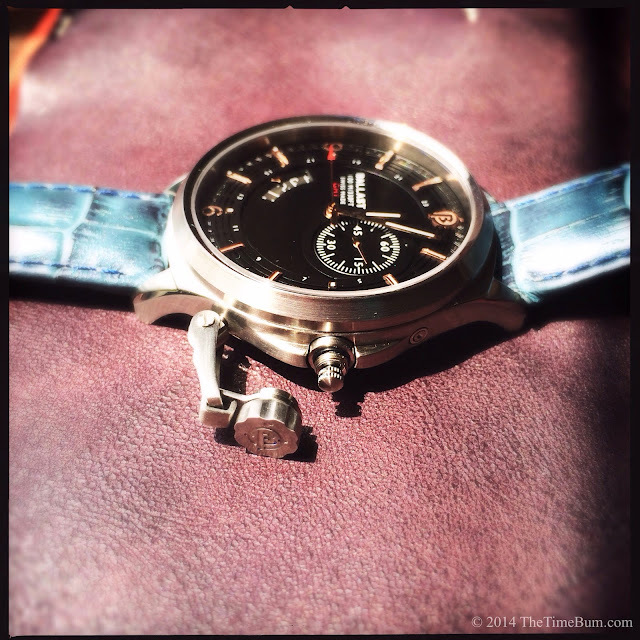 This is not the most common genre of watch design, and likely for good reason. Translating the design language of submarines to wrist wear is no mean feat. 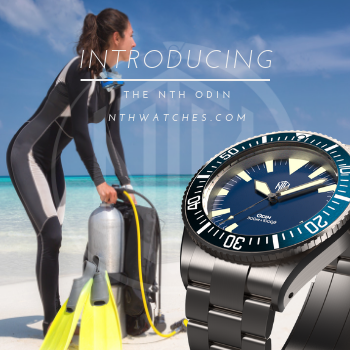 The watch is named for the Trafalgar Class nuclear submarines built in the 1980s and still in service with the British Royal Navy. They are formidable warships, but ugly as sin. Now, I understand is not their fault. These machines were built for function, not beauty. And who knows? They may be extremely attractive to other submarines, just not to me. 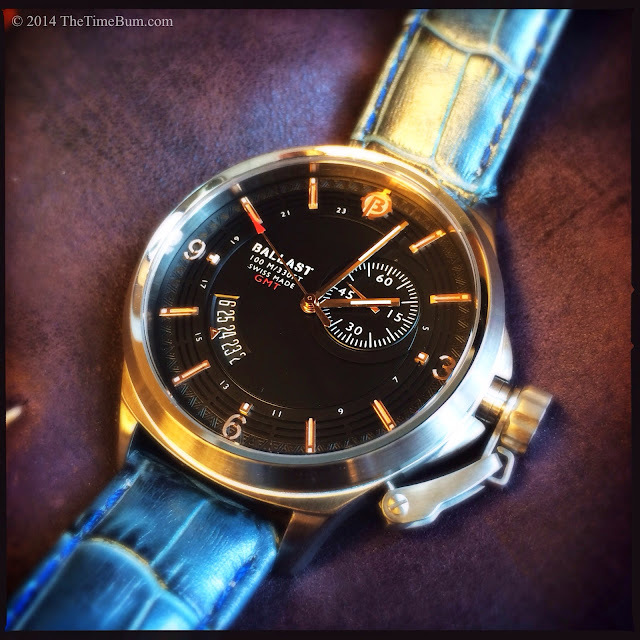 Ballast has plenty of of models that echo the brute functionality of these undersea machines, but that approach would not do for a dress watch. Remember all the beautiful submarine scenes in Das Boot? Like when Jack sees Rose descend that magnificent carved staircase and ... No wait, that was Titanic. Das Boot was full of sweaty guys jammed into a grimy sardine can. Alas, fantasy is always more attractive than reality and the submarine is no exception. In order to place the Ballast Trafalgar Dress in a proper design context, you must forget the unattractive undersea vessals of 20th century fact, and imagine the marvelous machines of 19th century fiction, specifically, the fantastic worlds of Jules Verne. "Now look at this clock; it is electrical, and goes with a regularity that defies the best chronometers. I have divided it into twenty-four hours, like the Italian clocks, because for me there is neither night nor day, sun nor moon, but only that factitious light that I take with me to the bottom of the sea. Look! Just now, it is ten o'clock in the morning." Captian Nemo, Twenty Thousand Leagues Under the Sea. I would like to imagine that the good Captain was discussing something like the Trafalgar Dress. Watch nerds may not find its battery driven ISA 8176 quartz to be as satisfying as a mechanical movement, but they cannot deny the accuracy of this Swiss movement. 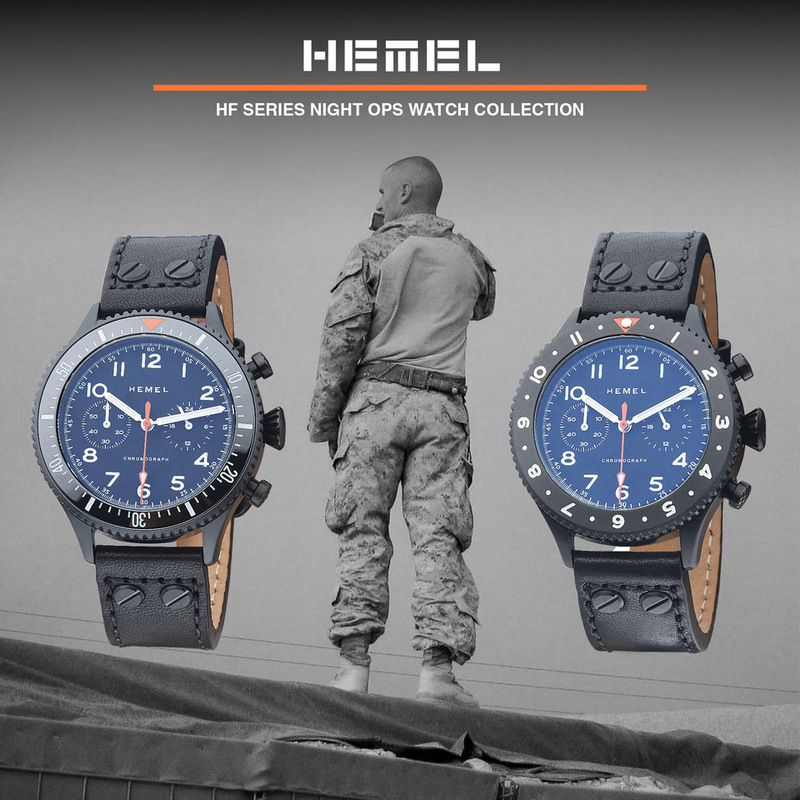 The BL-3126-02 is a GMT model, so while it has a conventional 12 hour dial, it is also marked for 24 hours like Captian Nemo's clock, with an independent hand to mark the hour in a second time zone. The brushed stainless steel case is 43mm wide, not including the oversize crown. 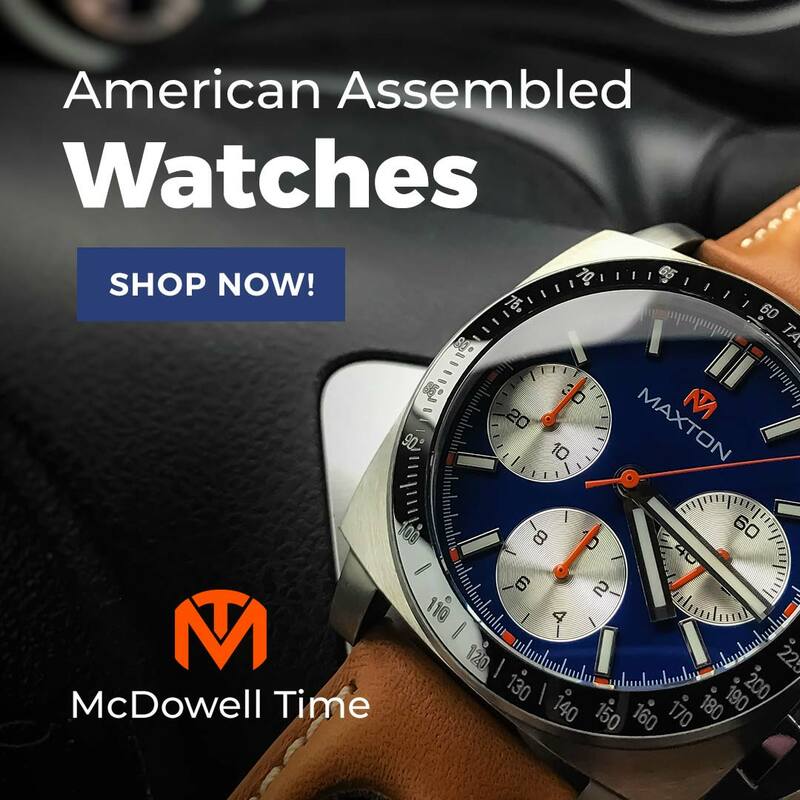 Its bezel rises above the flat sapphire crystal with a polished beveled inner edge, affording an extra measure of protection, and framing the dial with a subtle glint. The case back is polished and decorated. While the case is quite broad, it is not overly tall (52mm) or thick (11.25mm). The lugs are relatively short in comparison to the broad case. They taper to slim wedges and are positioned only 20mm apart, a design choice that makes the expansive case and dial appear even larger. 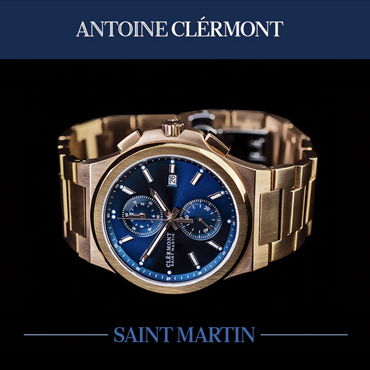 Water resistance is 100 meters, which will not carry the watch to submarine depths, but is excellent for a dress watch. 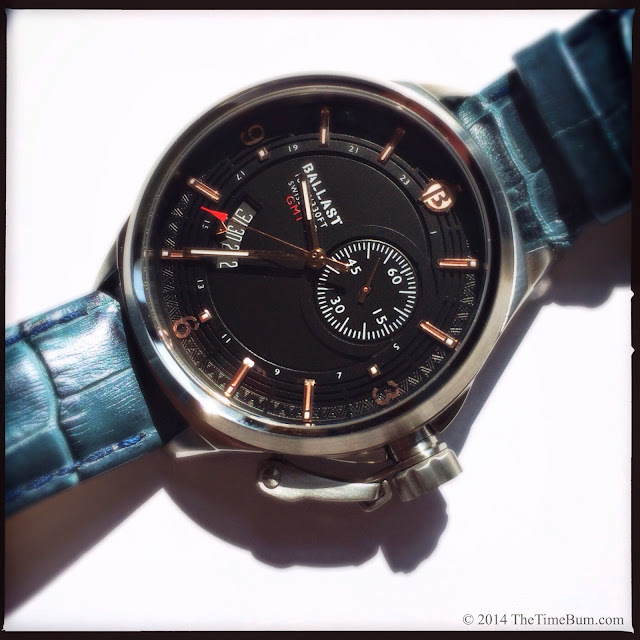 The GMT (Greenwich Mean Time) function displays a second time zone through the use of an independent hour hand. The hand is set by pulling the crown to first position and pushing a button positioned at 2 o'clock. This button is flush with the side of the case, so you must use a tool to depress it. The watch was not shipped with one, so I used a blunt ended pin tool from another watch that uses the same system for setting its complications. With the tool, it was easy. Without it, one might be tempted to use a paper clip or other item with a sharp or pointed end, which could scratch the button or case. I would suggest you choose your GMT button instrument carefully. Nemo's sub, the Nautilus, featured a grand salon with a pipe organ, huge glass windows, and other luxuriant appointments, and the steampunk details of the Trafalgar Dress would fit far more comfortably into that vessel than the industrial confines of a modern military sub. The black dial is fairly brimming with intricate details. The markers are positioned on the outermost edge of the dial, leaving a large negative space within. This area is laid out asymmetrically, with a small seconds sub dial in the upper right quadrant, branding and text clustered in the upper left, and a three-day date window in the lower left. It seems awkward when described, but it works quite well. Hours are represented by bars, numerals 3/6/9, and the Ballast logo at 12 o'clock, all in applied rose gold on a raised ring. An ornate repeating triangle pattern frames this ring, with a slotted pattern in the center, and the 24 hour markers printed in white on the innermost edge. The bar markers are slotted, and dotted with lume. 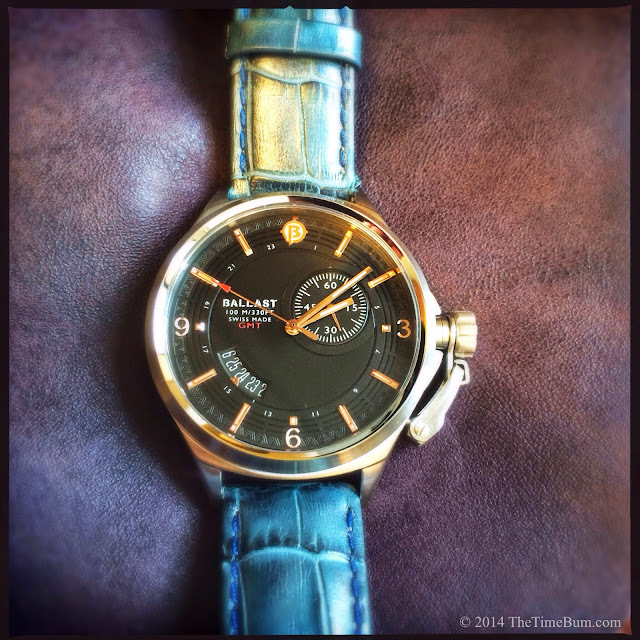 The hour and minute hands are slender, lume filled batons. The second and GMT hands are also gold, and the GMT is tipped with a red arrowhead. The date is indicated by a rose gold triangle in the same shape at those in the decorative pattern. The most striking element is the canteen crown, a hallmark of the Ballast line that finds its way into every model. A hinged arm attached to the lower half of the case holds a signed cap that screws down over the crown. I must confess, I am not a fan of the canteen. It is bulky, entirely unnecessary, and when that huge cover is unscrewed, you are left with only an infinitesimal nub. It is an affectation, but on this watch, that is the point. After all, unduly complicated exposed apparatuses are essential to steampunk fashion. 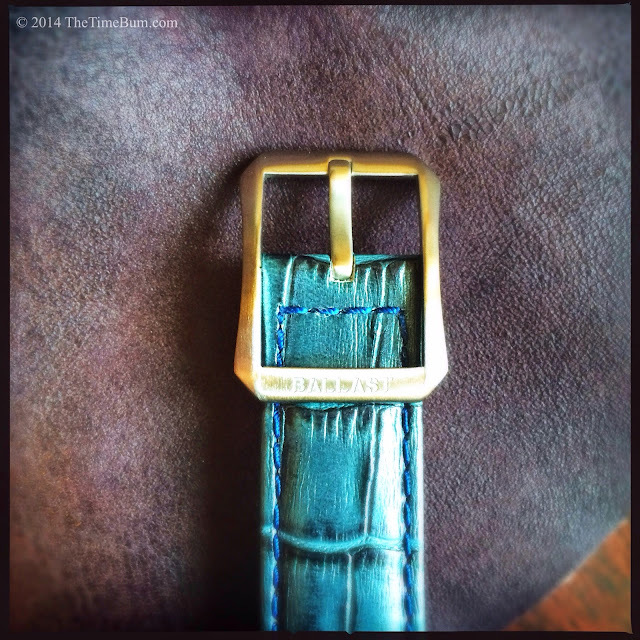 The strap is light blue leather with an embossed crocodile skin print. It is 20mm wide, tapering to an 18mm buckle with a long, signed frame through which you tuck the tail. I found it complemented the watch nicely, but 85/125mm it was far too long for my 6.5" wrist, even cinched to the last adjustment hole. For me, a strap swap would be in order; a task made easier by the integrated quick release spring bars. 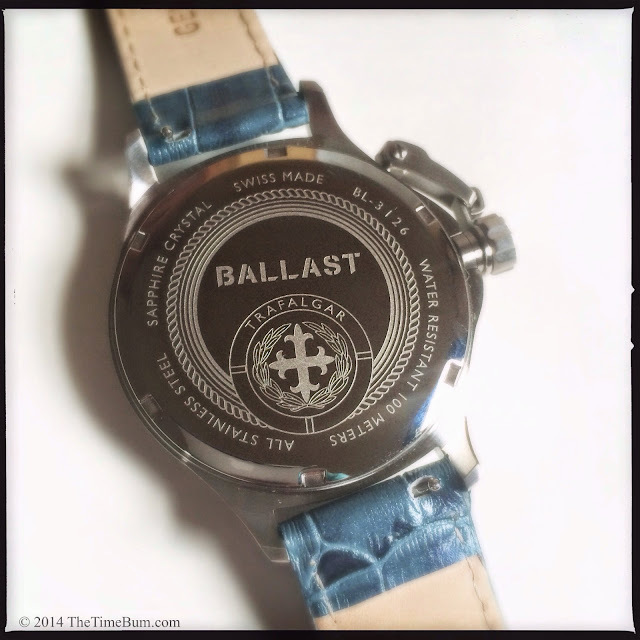 The Ballast Trafalgar Dress is an interesting and well executed piece, but I am left wondering if it is really a dress watch. It is larger than most dress watches, and has the decidedly un-dressy canteen crown guard appendage. On the other hand, it features some rather pretty detailing and that slim croc strap. It is thin enough to work under a shirt cuff, but I cannot imagine wearing it with a suit. I suspect the watch is intended for a different demographic than my own. This is not a watch for a middle-aged attorney, but a twenty-something could certainly rock this for a night on the town. Given its unique style, it would be an interesting woman's watch, in which case its oversize proportions would be even more exaggerated, and perhaps to greater effect. If conservative dress watches bore you, if you would rather defy convention, or if you need an appropriate time piece to match your Victorian waistcoat and brass goggles, the Trafalgar Dress GMT might be the watch for you. 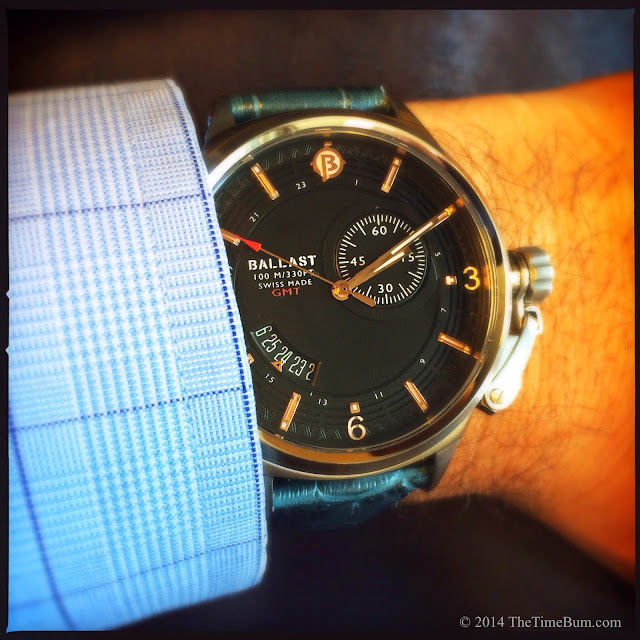 The Trafalgar Dress GMT has an MSRP of $599 and sells for $399 on the Ballast 1903 web store. Con: Outrageous crown guard contraption.